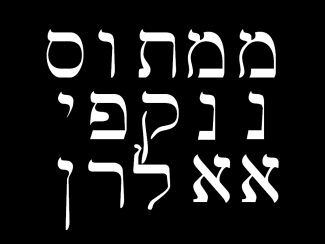 To understand the cryptogram you have to understand a little about how Hebrew words work. Most words come from a three letter root. Hebrew has no true vowels. So different vowel sounds change the meaning of the words. One root word can be read numerous ways. The text only gives us the letters that make up the message. But these words are not evident until Daniel decodes it. Why cant the other diviners read the message? This is where the theory about the cryptogram comes up. What if the letters were arranged in an unusual and atypical way? There is a legend that the inscription was written in columns. 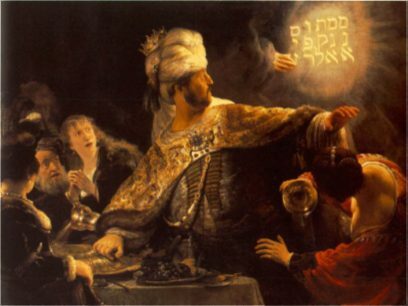 That is the way Rembrandt pictured it in his 1632 painting. He learned this interpretation from his friend Manasseh ben-Israel in Amsterdam. The color changes above show how the four words (including the for and) could be arranged. More importantly is the how the words have double meaning depending on whether it is a noun or verb. This chart describes how Daniel understands the riddle. So, Daniel is assuming that the riddle refers to an assortment of coins, but also functions as a prophecy of doom on Belshazzar. 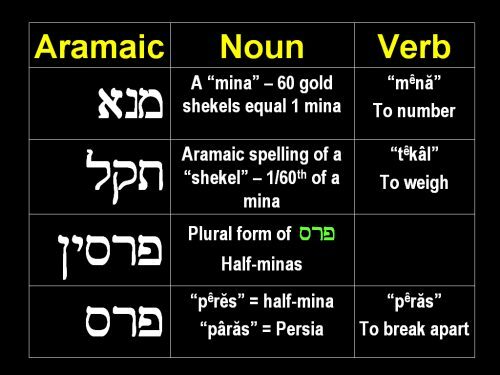 It isnt accidental that the word for half-mina can also be read as Persia. The aftermath is reported as Belshazzars immediate fall and the conquest of Persia. A new ruler is in charge of Babylon. The mighty have fallen.